Instead of buying expensive lamp shades, why not buy a less costly plain shade and dress it up just the way you want it. Not only will you be saving money, when you do it yourself, but you can also customize your lamp to fit your decor. I have done this with several lamp shades throughout my house and I am always happy with the unique designs that I can get with a few creative materials. It’s real easy to quickly add a little fabric paint to the shade for some custom color. I used a simple stencil just around the top of this first shade to add a bit of subtle color. It was quick and easy and added a little style to an otherwise plain shade. 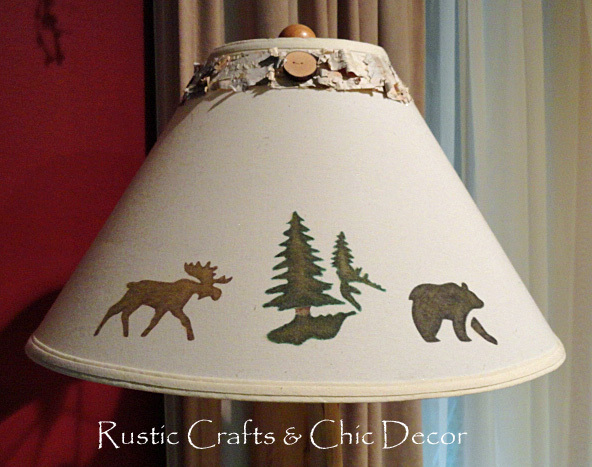 This lampshade design was created with stencils and birch bark. After stenciling on the bear and moose pattern, I wanted to add some fun detail to the top. 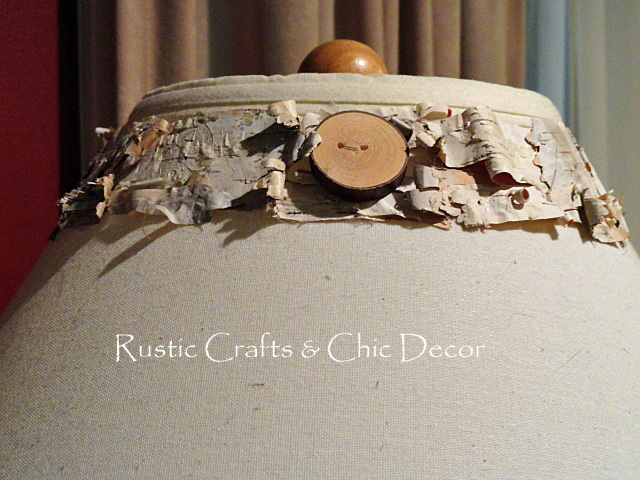 I used one of my favorite elements, birch bark, and glued strips of it around the top about an inch and a half wide. It still needed a little something so I added one of my homemade wooden buttons to the center by actually sewing it on to the lamp shade. Close up of lamp shade birch detail. Close up of lamp shade stenciling. 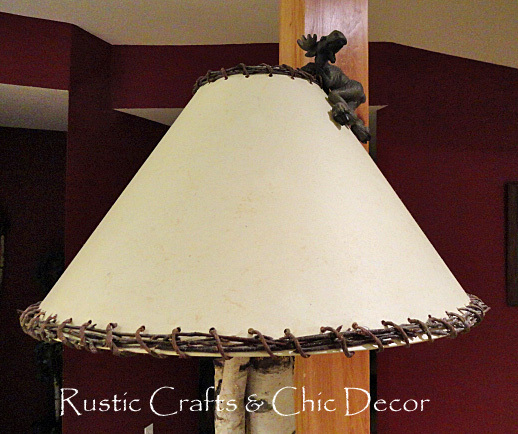 Do it yourself woven birch branch lampshade. I had to punch holes in the top and bottom of the shade so I could weave a large piece of bark covered wire through the holes. I kept inserting birch branches through the wire as I was tightening it to the shade. You can see the full tutorial here. 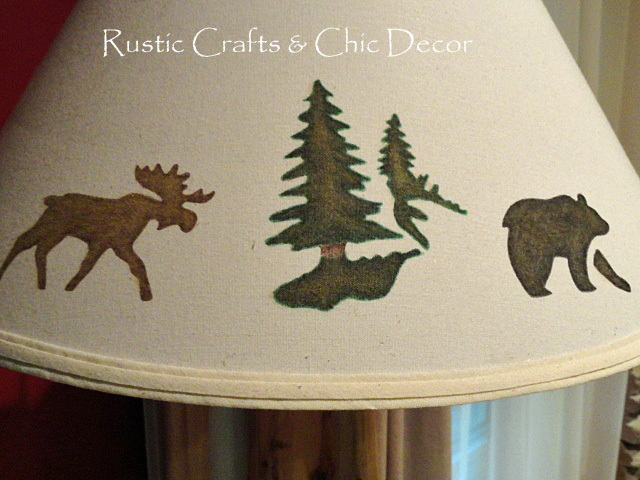 I found a cute hanging moose to attach to the top of the shade for a fun little accent! 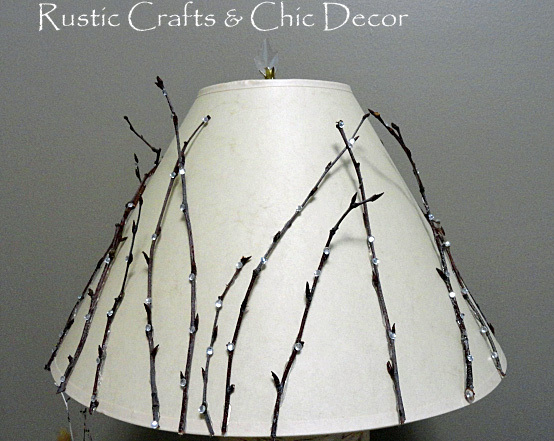 Lamp shade design created with birch branches and rhinstones. I just glued some birch branches from the base of the shade, up. For some extra glamour, I added some small rhinestones to the branches. It kind of reminded me of ice on tree branches! Awesome lamp shades I love the lodge rustic look! !